Imagine, for a moment, that you have just inherited control over Dungeons & Dragons, the most popular roleplaying game in the world. At first, you might think that you've been given a dream job. But then you realize that the entire roleplaying game industry is fighting a war for market share against the unyielding competition from videogames and collectible card games, and that everyone from your CEO to your fanbase is clamoring for you to find a strategy to win the fight. And then you realize that the most recent edition of D&D, in its attempt to find a winning strategy, was accused of betraying the very D&D legacy it sought to uphold. And then you remember that not only is your immediate predecessor "pursuing new opportunities," so is your predecessor's predecessor, and his predecessor's predecessor, and that if you don't do something really spectacular, you'll probably have to start "pursuing new opportunities," too. You've now roleplayed being Mike Mearls. Mearls is the man overseeing the launch of the new Red Box and the forthcoming D&D Essentials line. Before joining Wizards of the Coast in 2005, Mearls was mostly known for designing the Iron Heroes supplement for D&D 3.5 in collaboration with the legendary Monte Cook. At Wizards, he became a lead developer for Dungeons & Dragons working on 4th Edition (4E.) At Wizards, a "developer" is not a "designer;" but is responsible for taking systems created by a designer and revising them into a coherent whole. It's akin to being the colorist in a comic book - you're working within the lines drawn by someone else. But Mearls didn't stay a developer for long. By the time 4E had shipped, Mearls was a Lead Designer on the game, and with the departure of 4th Edition's original Lead Designer Rob Heinsoo in December 2009 and its Design & Development Director Andy Collins in May 2010, he was promoted again. Mearls is now the overall D&D Manager (full title: Dungeons & Dragons Roleplaying Game R&D Group Manager) for Wizards of the Coast, and it is his vision that will now shape the future of D&D, the seminal roleplaying game. Unfortunately for him, 4th Edition has been the subject of withering criticism from many fans of previous editions. Some of those fans say that Mearls betrayed everything that D&D has ever stood for. A popular thread at the ENWorld RPG community called "Mike Mearls Ruined Everything" is up to seven pages. That's a heavy cross to bear, especially for a man who clearly, if his blog is any evidence, eats, breathes, and sleeps classic D&D. The Escapist sat down with Mearls recently to get his sense of what had gone wrong, and what he was going to do about it going forward. 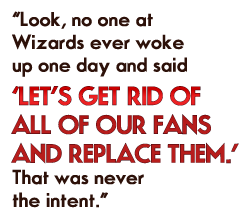 "Look, no one at Wizards ever woke up one day and said 'Let's get rid of all of our fans and replace them.' That was never the intent," Mearls said. "With 4th Edition, there were good intentions. We are D&D fans. We want D&D to be the best roleplaying game it can be. We're always open to change, to reacting to what people say."